PAGO- Geological summary by global volcanism program ( Smithsonian inst./ USGS): Pago is a young post-caldera cone that was constructed within the 5.5 x 7.5 km Witori caldera. The Buru caldera cuts the SW flank of Witori volcano. The gently sloping outer flanks of Witori volcano consist primarily of dacitic pyroclastic-flow and airfall deposits produced during a series of five major explosive eruptions from about 5600 to 1200 years ago, many of which may have been assocciated with caldera formation. The post-caldera cone of Witori, Mount Pago, may have formed less than 350 years ago. Pago has grown to a height above that of the Witori caldera rim. A series of ten dacitic lava flows from Pago covers much of the caldera floor. The youngest of these was erupted during 2002-2003 from vents extending from the summit nearly to the NW caldera wall. Based on analyses of satellite imagery, the Darwin VAAC reported that on 11 July an ash plume from Pago rose to an altitude of 4.3 km (14,000 ft) a.s.l. and drifted over 275 km SW.
2012 JULY- 11 JULY- 10? NOTES ON THIS PAGES: This page was last modified in SEPTEMBER 2017 : The Smithsonian institute has modified its website ! I have not realised yet, that links to the volcanic knowledge base IN THE REGISTER PANELS (/ right side) were no more working afterwards . I have started to repair and update all the links on some of my regional maps yet ( see Map of Indonesia) and will also (until end of 2017) repair links on this side. ABOUT YASUR ( geological summary by Smithsonian instuitute/ global volcanism program): Yasur, the best-known and most frequently visited of the Vanuatu volcanoes, has been in more-or-less continuous strombolian and vulcanian activity since Captain Cook observed ash eruptions in 1774. This style of activity may have continued for the past 800 years. Yasur, located at the SE tip of Tanna Island, is a mostly unvegetated 361-m-high pyroclastic cone with a nearly circular, 400-m-wide summit crater. Yasur is largely contained within the small Yenkahe caldera and is the youngest of a group of Holocene volcanic centers constructed over the down-dropped NE flank of the Pleistocene Tukosmeru volcano. The Yenkahe horst is located within the Siwi ring fracture, a 4-km-wide, horseshoe-shaped caldera associated with eruption of the andesitic Siwi pyroclastic sequence. Active tectonism along the Yenkahe horst accompanying eruptions of Yasur has raised Port Resolution harbor more than 20 m during the past century. On 19 November, the Vanuatu Geohazards Observatory reported that a new phase of ash emissions from Yasur began on 3 November. The intensity of the explosive activity remained low; therefore the Alert Level remained at 1 (on a scale of 0-4). 2013 NOV 19 NOV- 19? 2013 MAY- 29 MAY- 29? On 28 May, the Vanuatu Geohazards Observatory reported that activity at Yasur continued to increase slightly, and bombs fell around the summit area, the tourist walk, and the parking area. Ash venting and dense white plumes from the crater were observed. Photos included in the report showed ash emissions and ashfall on 5 and 8 May, and dense white plumes on 23 and 24 May. The Alert Level remained at 2 (on a scale of 0-4). 2013 APRIL- 07 APR- 09? Following an assessment during 7-12 July, the Geohazards Observatory team concluded that explosive activity at Yasur had slightly increased, becoming stronger and more frequent, and shifting from Strombolian to sub-Plinian. Bombs ejected from the vents fell in the crater, around the summit area, and on the tourist walk and parking area. The explosions were heard, felt, and observed from nearby villages and schools. Activity at all three volcanic vents was characterized by degassing, ash emissions, and ejection of bombs. On 13 July the Alert Level was raised to 3 (on a scale of 0-4). 2011 MAY- 19 JUNE- 22? Yasur, the best-known and most frequently visited of the Vanuatu volcanoes, has been in more-or-less continuous Strombolian and vulcanian activity since Captain Cook observed ash eruptions in 1774. This style of activity may have continued for the past 800 years. Yasur is a mostly unvegetated pyroclastic cone with a nearly circular, 400-m-wide summit crater. Yasur is largely contained within the small Yenkahe caldera in SE Tanna Island. It is the youngest of a group of Holocene volcanic centers constructed over the down-dropped NE flank of the Pleistocene Tukosmeru volcano. Active tectonism along the Yenkahe horst accompanying eruptions of Yasur has raised Port Resolution harbor more than 20 m during the past century. ABOUT AMBRYM ( geological summary by Smithsonian instuitute/ global volcanism program): Ambrym, a large basaltic volcano with a 12-km-wide caldera, is one of the most active volcanoes of the New Hebrides arc. A thick, almost exclusively pyroclastic sequence, initially dacitic, then basaltic, overlies lava flows of a pre-caldera shield volcano. The caldera was formed during a major Plinian eruption with dacitic pyroclastic flows about 1900 years ago. Post-caldera eruptions, primarily from Marum and Benbow cones, have partially filled the caldera floor and produced lava flows that ponded on the caldera floor or overflowed through gaps in the caldera rim. Post-caldera eruptions have also formed a series of scoria cones and maars along a fissure system oriented ENE-WSW. Eruptions have apparently occurred almost yearly during historical time from cones within the caldera or from flank vents. However, from 1850 to 1950, reporting was mostly limited to extra-caldera eruptions that would have affected local populations. According to NASA's Earth Observatory, a satellite image acquired on 9 August showed steam-and-gas plumes rising from Ambrym’s Benbow cone and from the active lava lake in Mbwelesu Crater (one of three active sub-craters of the Marun cone). 2013 AUG- 09 AUG- 20? 2013 JULY- 26 JULY- 30? The Vanuatu Geohazards Observatory reported that activity at Ambrym slightly increased to a minor eruptive phase, and a seismic swarm was detected between 2400 and 0700 on 26 July. The Alert Level remained at 1 (on a scale of 0-4). 2013 JUNE- 12 JUNE- 25? On 21 June the Vanuatu Geohazards Observatory reported that satellite images on 2, 4, 11, 14, and 16 June detected gas emissions from Ambrym. Emissions of minor amounts of ash and substantial amounts of gas from the active vents had been detected during the previous week. The report warned that communities on the island, especially those downwind of Ambrym, may experience ashfall and acid rain that could damage to the environment and contaminate water. The Alert Level remained at 1 (on a scale of 0-4). 2011 JULY 19 JULY 26? Based on pilot observations and analyses of satellite imagery, the Wellington VAAC reported that on 19 July an ash plume from Ambrym rose to an altitude of 3 km (10,000 ft) a.s.l. and drifted 185 km NW. 2011 JUNE- 27 JUNE- 28? On 27 June, the Vanuatu Geohazards Observatory reported that data collected from Ambrym's monitoring network showed significant degassing daily and occasional explosions in the crater. Field observers noted that the level of the lava lakes was high. During June, villages reported minor ashfall and that acid rain affected vegetables in some areas W, S, and E. The Alert Level remained at 1 (on a scale of 0-4). ABOUT TOFUA ( geological summary by Smithsonian instuitute/ global volcanism program):The low, forested Tofua Island in the central part of the Tonga Islands group is the emergent summit of a large stratovolcano that was seen in eruption by Captain Cook in 1774. The first Caucasian to set foot on the 515-m-high island was Capt. William Bligh in 1789, just after the renowned mutiny on the "Bounty." The volcano's summit contains a 5-km-wide caldera whose walls drop steeply about 500 m. Three post-caldera cones were constructed at the northern end of a cold fresh-water caldera lake, whose surface lies only 30 m above sea level. The easternmost cone has three craters and produced young basaltic-andesite lava flows, some of which traveled into the caldera lake. The largest and northernmost of the cones, Lofia, has a steep-sided crater that is 70 m wide and 120 m deep and has been the source of historical eruptions, first reported in the 18th century. The fumarolically active crater of Lofia has a flat floor formed by a ponded lava flow. Based on information from Tonga Meteorological Services and pilot observations, the Wellington VAAC reported that a cloud from Tofua rose to an altitude of 1.2 km (4,000 ft) a.s.l. local ref> Badan Geology/ Indonesia gov. READ ABOUT THE GOOGLE EARTH FEATURE: this column contains Google Earth program orders: click on one of the names and Google Earth will open and automatically navigate to the coordinates of that specific volcano on Google Earth! Google Earth programs tips: If google Earth does that too slowly, you can increase that" navigations speed" as follows: Use the menu on top of your Google Earth program window : There, open one after another the register cards for >" tools" > options > navigation. on the navigation card you find te controller for " apporach speed ( deutsch: Anflugsgeschwindigkeit) Just increase the approach speed there as intended. Possibly you have to close and reopen Google Earth afterwards, that these changes ind the function take place! NOTES: To use this "find with Google" feature, you must have installed Google Earth. There is no problem known: Nevertheless, the use of Google Earth as well as tzhe use of all feature on alien-homepage.de is on your own risk. 65 SAVO- pos 9°8'0"S/ 159°49'0"E 0505-07= Stratovolcano Hi* SAVO 1847? 88 AUCKLAND FIELD- pos 36°54'0"S/ 174°52'0"E 0401-02= Volcanic field R* AUCKLAND FIELD 1350? NEW: From August- 09 on: register cards of volcanoes which have now present signs of stronger activity but are supposed to be still active ( including those to those updates are issued from time to time due to regularly inspections) will REMAIN within the map field. Register cards of volcanoes, for those no further activity report was issued during a few month (by GVP) will be sorted out to the "parking place" below that map! 35 = volcano + number). You find the name of the volcano and all infos in the registercard! updates on the map will be made weekly only if newly beginning ACTIVITIES reported are issued by USGS)! greenpeace/ 20140314) palmoil production/ Seen P&G's Thank You Mom? Find out the hidden truth. The GVP page is updated on Wednesdays. Please see the GVP Home Page for news of the latest significant activity. I began this reports in 2011 when the maps were completed . Everything needs a good while to be developed. In November 2011 I decided to make monthly reports those will be updated once per week. From 2012 on, you will find all archived reports( including video sources) by my new archive directory. ABOVE: VOLCANO WIDGET BY: volcano.discovery.com: enlargable worldwide volcano activity map (please note: This map is never 100% updated to the current global activities and uses other activity criteria. REMARKS: Its indeed a great task and in real more a "wish than reality " to survey all of the more than 800 active volcanoes worldwide! Thus, also my maps here (based on the weekly GVP report , also cannot necessarely report correctly all current volcano activities. Log on to the local// national survey institutes as listed above to get (hopefully) most recent informations, if needed. As the European plate is very massive, Earthquake magnitudes of 5.0 effect equal to magnitudes of 6.0 in other subduction zones and are counted as such. In the spreading zone to the North American continent in North Europe Earthquakes activities in 2011 even were more intensive than in all recent 5 years together . Numerous larger seismis shocks were registered on the boundary of the North American and Eurasia plate in 2011 mainly during the Arctic summer. All occured exactly on the boundary between the Eurasian and North American plate from the Norway latidude through Iceland up to the Eastern coast of Greenland and seem to creep more and more Northwards. Major seismic shocks up to M 4.9 ( volcanic "tremors") were also measured near to the Iceland volcanoes of Grimssvoetn, Hekla and Katla in 2011 yet and are believed to be sign of an upcoming large an d major eruption While Katla does not show any significant signs of an eruption on the surface yet, in July 2011 the increasing activity in its interior suddenly melted the ice cap above the crater and the melting water rushing down form its flanks destroyed a bridge. Some Seismic shocks with magnitudes up to M 4.6 o also were measured along the continental shelf of Scandinavia since 2011.,those were stronger to the North than to the South. There is no known active volcano around. As I have in suspect, this can only be an indicator for some new or old brake between Iceland and Norway, which may extend already further to the South ( either towards the Atlantic ridge or even between Great Britain and Scandinavia. The most interesting as well as unprecendented event in 2011 was and is the sudden activity of the El Hierro shield volcano, that forms the most Southern island the Canary islands. More than 10.000 seismic tremor shocks were registered between June and September 2011 South East and North West of the island, before a new subsea volcano Southeast of La Restinga began to erupt. oil rigs and seaquakes:Good evidence for such a process also gave three hot blowouts those occured after May 2010 at three Norwegian offshore oil rigs. Also the last incident at the Gannet oil field in Aug 2011 could be related to a minor tectonic movement. But so much is not known jet, neitern of the course of the incident nor wehre the leak actually isloated. Media claim the main leakage would be indeed at any wellhead and might therefore also come out from the oil resservoir itself through the annullus of one of the 7 borehole installations.> Fortunately ( and sad as well , as no other country has yet joined yet except Brasil ) ,the government of Norway prescribes for any offshore drilling/borehole in Norway beside Blowoutpreventer so called" downhole security valves- . This is an very reliable safety valve which is mounted on the lower end of the production line where the pipe leads into the oil resservoir itself. Its designed as a steel bowl , which can close the pipe from below the oilm resservoir and closes more tight as more pressure comes on it , The three Norwegian oiol rigs were evacuated , the safetyl valves closed and nothing reulted of this blowouts. Noone nijured no dagame and no oil spill. Some barrely may have escaped but tjhis is nothing compared rto what could and would have happened if no safety valve would have been in place and the BOP fails to operate due to a pressure it cannot resist - or even would be torn apart as it was the case in BP Macondo well "A" in the Macondo well intallation in 2010 ( remark: on TV only the leakage and oil spill at well location " B" was shown.. PR at its best! Read more on my documentary. Just click on the link above this texbox! read my report. on the following page: click here.
. When I first in May 2010 searched for for data of the Sun activity to compared these with my " Earthquake statistics" it became clear with a while that there is a clear relationship . Almost one year of data collection and comparation (see for my Earthquake ststistics") showed first, there is a clear conicidence of Earthquake activity and sun activity. First I just compared the sun spot number ,the solar flux flare activities and also Coronal Holes ( as some had mentioned) . After the 9.0 seaquake in Japan on March 11- 2011 it was clearer , that indeed the socalled coronal mass ejections could be the immidiator of those huge Earthquake energies form the Sun. CMEs ar not light, but hot plasmatic Sun matter ejected into space, if enough electromagnetic energies concentrate around active sun spots or along filament to accelerate erupting sun matter above the gravuitational escape speed of the sun . A CME released from the Sun`s surface so first expands like a spring that was under pressure before. ( "Plasma"is a state of matter so hot that the subatomic particle form a kind of soup out of protons, neutrons and electrones.The hot high energetic sun plasma of a CME forms a kind of cloud in form of an expanding funnel, that - once ejected from the Sun then travels through space until. it hits any massive body there. Through the empty space it also does not losse much of its energy. Usually it takes 2- 4 days until such a CME arrives on Earth (depending on the current sun sind speed that can change from hour to hour) . Scientists obviously long time believed that the geomagnetic field would reject all of the subatomar particles including their high energies. But at least, the electromagnetic energies (cinetic energy) of arriving sun winds and CMEs easily penetrate the athmosphere and rather load up the geomagnetic field and the Earth a s such. When I started with my research in May 2010 I did not no about this NASA statement published by BBC: (BBC) Is Solar activity to blame for Japan's massive earthquake? Filament eruptions are likely the strongest eruptions on the Sun. They release long duration intensive sun wind streams in all directions , those were measured on the GOES magnetometer as a rise in the magnetic density to almost the double of the normal values, even if the major CME core passed the Earth. . This geomagnetic field density ( measured in nanoTesla) which must be interpretatealso as the electromagnetic energy level of the geomagnetical field. This actucal electromagnetical load or overload is likely the indicator or even the source of the observed typica effects , CME impacts- due to all recent statistics I have made-immidiately have on on the planet itself: increasing volcano activities/sudden strongs storms and other amplified weather parameters/ stronger Earthquakes in the aftermath. NOAA/ NASA with its main task to protect civil and military satellites from damages- never had observed this geomagnetic field density ,but only the socalled planetery "K" and "A" indices, those represent just the fluctuations in the geomagnetic field ( stronger fluctuations with higher amplitudes are called" geomagnetic storm") . These magnetometer values are provided by the satellites ACE (interplanetray magnetic field) and GOES (terrestrial gemoagnetic field) . As its is just not possible to send satellites to an orbit so close to the Sun, in order to retrieve exact measurements on the exact size and arrival time of CMEs, these magnetometers are the only valuable instruments those deliver reliable data on CME impacts such as their strength and energetic impacts. Recently NASA/ NOAA declared it wants to base their future space weather prediction more or exclusively on these magnetometer values. The problem is: If these CME data become available, the CME just neeeds another appr. 15 - 30 minutes- to Earth and prewarnings might therefor be too late and fail. More about current activities on that in my environmental blog. You can also visit my Earthquake research project on my page " evaluations"
ABOUT MANAM ( geological summary by Smithsonian instuitute/ global volcanism program): The 10-km-wide island of Manam, lying 13 km off the northern coast of mainland Papua New Guinea, is one of the country's most active volcanoes. Four large radial valleys extend from the unvegetated summit of the conical 1807-m-high basaltic-andesitic stratovolcano to its lower flanks. These "avalanche valleys," regularly spaced 90 degrees apart, channel lava flows and pyroclastic avalanches that have sometimes reached the coast. Two summit craters are present; both are active, although most historical eruptions have originated from the southern crater, concentrating eruptive products during much of the past century into the SE avalanche valley. Frequent historical eruptions, typically of mild-to-moderate scale, have been recorded at Manam since 1616. Occasional larger eruptions have produced pyroclastic flows and lava flows that reached flat-lying coastal areas and entered the sea, sometimes impacting populated areas. RVO reported that activity at both Manam's Southern Crater and Main Crater was low during 1-15 December; white vapor emissions rose from both craters. Light gray ash clouds rose from Southern Crater during 6, 10, and 13-14 December, and incandescence from the crater was observed during 6-10 and 12-13 December. Incandescence from Main Crater was visible during 11-13 and 15 December, and gray ash plumes rose from the crater during 13-14 December. No plumes from either crater rose more than 100 m during the reporting period. RVO reported that both Manam's Southern Crater and Main Crater were quiet during 1 October-15 November. White vapor emissions rose from Southern Crater and on some days were slightly bluish. Light gray ash clouds and bright incandescence were visible on 31 October. Main Crater only produced white vapor plumes. 2013 JULY- 15 SEP- 10? RVO reported that the increased activity at Manam noted during 17-18 June continued on 19 June, and then declined on 20 June. On 19 June diffuse dark gray ash plumes that rose 200 m above the summit crater were accompanied by deep, loud explosive and booming noises occurring at short intervals. Very loud explosions accompanied by shock waves were heard at much longer intervals. Observers noted ejected incandescent lava fragments at night. Decreased activity that started on 20 June carried through 30 June, and was characterized by diffuse ash emissions at the beginning of the period changing to diffuse white vapor emissions towards the end. Diffuse gray emissions rose from Main Crater during 19-22 June; explosion and booming noises were reported during 19-20 June. Seismicity was low. Activity at Southern Crater and Main Crater was low during 1-14 July; both craters emitted white vapor. RVO reported that during 1-12 June activity at Manam was low, characterized by white vapor emissions from Southern Crater. On 13 June diffuse gray emissions were observed, and two explosions at midnight were heard in Bogia, 25-30 km SSW of Manam on the N coast of the mainland. During 14-15 June gray-to-brown ash plumes rose 100 m above the crater and incandescent fragment ejections from the crater were observed at night. Residents on the W part of the island heard explosions on 15 June. Diffuse brown-to-black ash clouds rose 600-700 m above the crater on 17 June, and then changed to dense white clouds later that day. Strombolian activity observed at night was accompanied by roaring, rumbling, and explosion noises. Shock waves were occasionally felt. Strombolian activity increased on 18 June, generating plumes that rose 800 m above the crater. At 0635 a small-to-moderate sized pyroclastic flow traveled down the SE valley and stopped 400 m a.s.l. Ash plumes from the pyroclastic flow rose 900 m above the crater. Roaring, rumbling, and explosion noises were accompanied by occasional shock waves. Plumes drifted NW. Main Crater emitted white vapor plumes during 1-12 June. Weak but steady incandescence emanated from the crater at night on 2 and 17 June. 2013 MAY 21 MAY- 22? RVO reported that during 29 April-16 May activity at Manam was low, characterized by white, and sometimes blue, vapor plumes rising from Southern Crater. White vapor plumes also rose from Main Crater. Seismicity fluctuated but remained high until 1 May; seismicity then declined to a low on 4 May where it stayed for the rest of the period. RVO reminded people to stay away from the four main radial valleys, and especially the SE and SW ones where most products from the activity at Southern Crater were channeled. 2013 APR- 16 APR- 30? RVO reported that during 1-14 April Strombolian activity was observed from Manam Southern Crater. During 1-7 April ash plumes rose above the crater. Island residents reported incandescent tepha ejections from the crater at night, and roaring and rumbling noises. Activity increased on 8 April. Strombolian activity was sustained for extended periods during 9-11 and 13-14 April. Loud roaring and rumbling noises were reported by residents in Bogia, 25-30 km SSW of Manam on the N coast of the mainland. A few loud banging noises on 13 April rattled bush-material houses at Dugulava village on the SW side of the island. Most fragments from the Strombolian eruptions, including a small volume of lava, were channeled into SW valley. Ash plumes rose as high as 600 m above the summit crater and drifted NW. White vapor plumes rose from Main Crater during the reporting period. Based on observations of satellite imagery and wind data analyses, the Darwin VAAC reported that an ash plume from Manam rose to an altitude of 3 km (10,000 ft) a.s.l. on 28 January and drifted 22 km E. The next day an ash plume drifted 93 km NE, and then later another ash plume drifted 55 km NE at an altitude of 4.3 km (14,000 ft) a.s.l. 2013 JAN- 08 JAN- 15? RVO reported that dark gray ash plumes were occasionally emitted from Manam's Southern Crater during 8-12 January. At about 1000 on 12 January a sub-Plinian eruption generated ash plumes that rose 1.4-1.5 km above the crater; activity peaked between 1200 and 1300. The ash plumes drifted SW, S, and SE, producing ashfall on the island in areas downwind and light ashfall in Bogia (23 km SSW). Rumbling was heard in areas on the S and SW parts of the island, and a few loud booming noises were heard in Bogia. Activity decreased after 1600 and ash plumes only rose 500 m above the crater. At night ejected incandescent material was observed. Ejected material and ashfall was deposited in the SE and SW valleys. Ash plumes drifted S during 13-14 January. White vapor plumes rose from Main Crater during the reporting period. 2012 NOV- 19 DEC- 19? RVO reported that during 19-20 November white and blue vapor rose from Manam. Activity increased at 1200 on 20 November characterized by occasional emissions of dark grey ash. Ejected incandescent tephra was observed at night. At 1700 on 21 November a small pyroclastic flow traveled down the upper part of the SW valley. Stronger activity was detected two hours later which lasted until the next morning; incandescent tephra was ejected several hundred meters above the crater, roaring was heard in Bogia (23 km SSW), and a lava flow was extruded into the SE valley from a new vent beneath Southern Crater. The activity slightly decreased at 1700 on 22 November and diffuse ash plumes occasionally rose from the crater. Activity increased again on 24 November. Ash fell on the NW side of the island. Based on observations of satellite imagery and reports from RVO, the Darwin VAAC reported that an ash plume rose to an altitude of 3.3 km (11,000 ft) a.s.l. on 26 November and drifted 110 km E.
2012 NOV- 03 NOV- 06? RVO reported that Manam's Southern Crater continued to erupt during 1-15 October. Activity was low the first few days, characterized by emissions of light gray ash plumes, occasional dark gray plumes, and ejected incandescent tephra. The intensity of ejected incandescent tephra increased on 5 October, and peaked during 9-10 October when the ejections developed into Strombolian activity. Strong explosions during the Strombolian activity produced shock waves that rattled houses on the S part of the island. Activity subsided after 10 October; erupted material fell in the SE and SE valleys. There was a corresponding increase in emissions of ash clouds that drifted NW but the volume of ash appeared insignificant. White vapor plumes rose from Main Crater during the reporting period. Based on analyses of satellite imagery, the Darwin VAAC reported that on 15 October an ash plume rose to an altitude of 3 km (10,000 ft) a.s.l. and drifted 37 km SW.
RVO reported that variable low-level activity continued to be detected at Manam's Southern Crater during 16-30 September. White and occasionally gray ash plumes rose from the crater during 16-24 September, and gray ash clouds were observed during 25-29 September. Only white plumes rose from the crater on 30 September. Ash clouds drifted NW, producing ashfall in the NW part of the island. Two vents in the SE valley, just below the summit crater, produced small-volume lava flows, channeled into the deep ravines on the upper slopes of the SE valley. Glow from the crater was visible on most nights. Incandescent lava fragments were ejected from the crater during 16-17, 19-20, and 24-28 September. The ejections were occasionally sub-continuous to fountaining. Roaring and rumbling noises were sometimes heard at the Bogia station on the mainland on 16, 21, and 26 September. White vapor plumes rose from Main Crater during the reporting period. According to the Darwin VAAC a pilot reported an intermittent eruption with a diffuse ash plume on 8 October. During 8-9 October satellite imagery showed a thermal anomaly, and an ash plume that rose to an altitude of 3.4 km (11,000 ft) a.s.l. and drifted about 45 km ENE. RVO reported that activity at Manam increased slightly during 15-31 July, except from 18 to 20 July when there were fewer ash emissions. During most of the reporting period, when visibility was clear, gray-to-sometimes-black ash plumes were observed rising 300-700 m above the crater from two vents and drifting NW. Rumbling was often heard on the island; rumbling on 25 July was heard on the mainland 25 km SW. Bright glow visible at night was attributed to ejected incandescent tephra. Sub-Plinian activity occurred on most nights during 21-31 July. Small lava flows descended the SW flank. Four pyroclastic flows traveled down the SE flank on 30 July at 0638, 0640, during 1200-1300, and at 1428. The first event was the largest, and generated an ash plume that rose 1.8 km above the crater and drifted NW. Emissions from Main Crater were milder and mostly characterized by white and bluish plumes, and occasional gray ash plumes. RVO reported that four pyroclastic flows traveled down Manam's SE flank on 16 June. The following day activity was low; emissions were mostly steam with occasional ash. During 18-30 June gray ash clouds, that were sometimes black, rose 100-150 m above the crater and drifted mainly NW. Roaring and rumbling noises were sometimes reported. Incandescent tephra was ejected from the crater on most nights; activity during 28-29 June was almost Subplinian. Emissions from Main Crater were milder and mostly characterized by white and bluish plumes. Gray ash plumes were emitted during 18, 23, 26-27, and 29 June. Incandescence from the crater was visible during 18, 20-22, and 24 June. Ash fell in the NW part of the island. RVO reported low-to-moderate activity from Manam's Southern Crater during 1-15 June. Emissions consisted of gray and sometimes black ash clouds that rose from the crater on most days. Plumes drifted SE on 2 June and NW during 6-15 June. Ash fell in areas downwind between Yassa (WSW) and Baliau (NNW), and Warisi (ESE). Incandescent material was ejected from the crater, and roaring and rumbling noises were noted. Pyroclastic flows on 16 June (at 0700, 0720, 0722, and 0729) channeled into the SE valley. The last pyroclastic flow was perhaps the largest as it reached the lowest elevation, 300-400 m above sea level, but was far from populated areas. Ash plumes from the pyroclastic flows drifted WSW and WNW; ash fell in Bogia (22 km SSW, on the mainland). Emissions from Main Crater were milder and mostly characterized by white and bluish plumes. Light gray plumes were noted during 2 and 8-9 June. Fluctuating incandescence was intermittently observed and ash fell in the NW part of the island. 2012 JUNE 05 June- 05? RVO reported mild activity from Manam's Southern Crater during the first two weeks of May. Emissions consisted of diffuse white vapor, with diffuse blue plumes observed during 5-6 and 13-14 May. Gray and gray-brown ash clouds rose from the crater on 7, 9, and 12 May. Incandescence was visible at night during 6, 8, 10-11, and 13-14 May, and incandescent tephra was occasionally ejected from the crater. Activity increased on 16 May, marked by a change in emissions from gray and gray-brown ash clouds to gray-to-black ash clouds, and an increase in ejected incandescent tephra. On 27 and 30 May Strombolian activity was observed, and for periods lasting 1-2 hours incandescent tephra was continuously ejected from the crater. On 30 May two vents in Southern Crater produced lava fountains. Rumbling was heard, and ash plumes rose 100-400 m above the crater and drifted NW. Most of the ejected tephra fell back into the crater but some was channeled into the SE and SW valleys. Emissions from Main Crater were milder and mostly characterized by white plumes. Gray-to-gray-brown ash plumes were noted during 6, 10-11, 13, 26, 28-29, and 31 May. Fluctuating incandescence was intermittently observed. Ash fell in the NW part of the island. 2011 Nov- 11 Nov- 15? Based on analysis of satellite imagery and a pilot observation, the Darwin VAAC reported that on 11 November an ash plume from Manam rose to an altitude of 3 km (10,000 ft) a.s.l. and drifted about 90 km NE. 2011 Oct- 18 OCT- 25? Based on analysis of satellite imagery, the Darwin VAAC reported that on 18 October ash plumes from Manam rose to an altitude of 3.7 km (12,000 ft) a.s.l. and drifted 150-170 km NW. 2011 AUG- 17 Aug- 23? RVO reported that the summit area of Manam was obscured by atmospheric clouds on most days during 1-19 August. When the summit was clear to viewers on the mainland, 15-20 km away from Manam, both vents were emitting white vapor plumes. Main Crater produced light-gray ash clouds during 13 and 17-18 August, and bright, steady incandescence was visible on most clear nights. Weak incandescence was visible from Southern Crater on some nights. People living on the island reported occasional noises from both craters on 3 and 11 August. Seismicity during the reporting period was dominated by volcanic tremors. Discrete high-frequency volcano-tectonic earthquakes were also recorded. RVO noted that high-frequency volcano-tectonic earthquakes are not very common for Manam. An electronic tiltmeter located about 4 km SW from the summit craters continued to show inflation towards the summit area. By clicking on the small image thumbs, you get to the first of several regional volcano maps, as part of my world volcano map project. These regional maps enhance some regions, those are so densely populated with volcanoes, that the great map cannot display them well enough. The following regional maps are planned for 2011: Indonesia, Chile, Japan. Please be patient. This map was the first one others will follow soon. Its much works and much must be tested and later be improved many times! How to use: (1) Each volcano has a number at its location on the map. (2) With that numbers of the volcano you can easily find the volcanoes name in either one of the associated registers. ( 3) register one is consisting out of Di-labels you find around in te map itself: just click on the name and you will be linked to the website of the Smithsonian institute/ USGS ( world volcanism program) where you find all kinds of informations related to that specific volcano. (4) register is another register ( a so called " collapsible panel"): just have to click on the tab " find with " Google Earth" and the register card will open. (it can be closed in the same way just by clicking in the tab). This "register card" als has a complete name list of all volcanoes on that map. Clicking on one of these names will open your Google Earth program and Google Earth will automatically navigate exacly to the longitudes and latitudes of that volcano, and you can see it on the realistic Google maps. Google Earth has some very nice good pictures and 3 D displays of many volcanoes" JUst enjoy! ( note: For this feature you need to have installed the freeware program "Google Earth first- You find a direct downo load link which leads to the original Google Earth website also in the register card!= no problem! Based on analysis of data collected by the Vanuatu Meteorology and Geohazards Department (VMGD), the Vanuatu Geohazards Observatory reported that a small series of explosions from Aoba occurred on 10 July. Photos showed that the volcano was quiet on 12 July, although ongoing earthquakes were detected. On 18 July the Vanuatu Volcano Alert Level (VVAL) remained at 1 (on a scale of 0-4). According to observations by the Vanuatu Meteorology and Geohazards Department, a report from 6 March stated that the minor activity at Aoba that began in December 2012 was likely continuing. Satellite images acquired on 3 and 26 February detected substantial sulfur dioxide emissions. The Vanuatu Volcano Alert Level (VVAL) remained at 1 (on a scale of 0-4). 2013 JAN- 30 Feb- 12? According to the Vanuatu Geohazards Observatory, Ambanga villagers reported that minor activity at Aoba began in December 2012. The OMI instrument detected strong gas emissions on 18 and 25 January; the emissions continued at a lower level through 7 February. Field observations by the Geohazards team during 30 January-2 February confirmed that activity had significantly changed. Data retrieved from a monitoring station also confirmed ongoing activity. The Vanuatu Volcano Alert Level (VVAL) remained at 1 (on a scale of 0-4). 2011 JULY- 11 JULY- 29? On 11 July the Vanuatu Geohazards Observatory noted that there had been recent increases in activity from Aoba and that local earthquakes were volcanic. Satellite images collected by the Ozone Monitoring Instrument showed sulfur dioxide emissions. Observations on 4 June revealed that small explosions had been occurring from the crater lake and were accompanied by local ashfall around the crater. Some villagers in the N and W parts of the island had observed the explosions. The Vanuatu Volcano Alert Level (VVAL) remained at 1 (on a scale of 0-4). BAGANA- Geological summary by global volcanism program ( Smithsonian inst./ USGS):Geologic Summary. Bagana volcano, occupying a remote portion of central Bougainville Island, is one of Melanesia's youngest and most active volcanoes. Bagana is a massive symmetrical lava cone largely constructed by an accumulation of viscous andesitic lava flows. The entire lava cone could have been constructed in about 300 years at its present rate of lava production. Eruptive activity at Bagana is characterized by non-explosive effusion of viscous lava that maintains a small lava dome in the summit crater, although explosive activity occasionally producing pyroclastic flows also occurs. Lava flows form dramatic, freshly preserved tongue-shaped lobes up to 50-m-thick with prominent levees that descend the volcano's flanks on all sides. Based on analyses of satellite imagery and wind data, the Darwin VAAC reported that on 22 March an ash plume from Bagana rose to an altitude of 3 km (10,000 ft) a.s.l. and drifted 110 km NE. 2014 MARCH 22 MAR 26? 2013 DEC 05 DEC 10? Based on analyses of satellite imagery and wind data, the Darwin VAAC reported that during 5-6 December ash plumes from Bagana drifted 55-65 km W. During 9-10 December ash plumes rose to an altitude of 3 km (10,000 ft) a.s.l. and drifted 35-45 km NE and E.
2013 NOV- 14 NOV- 19? Based on analyses of satellite imagery and wind data, the Darwin VAAC reported that during 14-18 November ash plumes from Bagana rose to an altitude of 2.7 km (9,000 ft) a.s.l. and drifted 35-110 km W and SW.
Based on analyses of satellite imagery and wind data, the Darwin VAAC reported that during 16-17 September ash plumes from Bagana rose to an altitude of 2.4 km (8,000 ft) a.s.l. and drifted 35-55 km NW and SW.
2013 JUNE- 17 JUNE- 18? Based on analyses of satellite imagery and wind data, the Darwin VAAC reported that on 17 June an ash plume from Bagana rose to altitudes of 2.1-2.4 km (7,000-8,000 ft) a.s.l. and drifted over 35 km NW. 2013 MAY- 24 JUNE- 04? Based on analyses of satellite imagery and wind data, the Darwin VAAC reported that on 24 May an ash plume from Bagana rose to an altitude of 2.1 km (7,000 ft) a.s.l. and drifted over 35 km NW and N.
2013 MAY- 05 MAY- 07? Based on analyses of satellite imagery and wind data, the Darwin VAAC reported that during 5-6 May ash plumes from Bagana rose to an altitude of 2.1 km (7,000 ft) a.s.l. and drifted 75-85 km W.
2013 APR- 10 APR- 23? Based on analyses of satellite imagery and wind data, the Darwin VAAC reported that during 10-11 April ash plumes from Bagana rose to an altitude of 2.4 km (8,000 ft) a.s.l. and drifted 75 km SW and W. On 15 April an ash plume rose to an altitude of 1.8 km (6,000 ft) a.s.l. and drifted almost 30 km S and W. The next day ash plumes rose to an altitude of 3 km (10,000 ft) a.s.l. and drifted 65 km SW.
2013 MAR- 25 MAR- 26? Based on analyses of satellite imagery and wind data, the Darwin VAAC reported that during 25-26 March ash plumes from Bagana rose to an altitude of 3 km (10,000 ft) a.s.l. and drifted 45-55 km E.
2013 FEB- 08 FEB- 19? Based on analyses of satellite imagery and wind data, the Darwin VAAC reported that during 8-12 February ash plumes from Bagana rose to altitudes of 1.5-3 km (5,000-10,000 ft) a.s.l. and drifted 35-130 km E and NW. 2012 Sep- 27 OCT- 09? Based on analyses of satellite imagery, the Darwin VAAC reported that on 27 September an ash plume from Bagana rose to an altitude of 2.4 km (8,000 ft) a.s.l. and drifted 37 km N.
2012 AUGUST- 02 Aug- 07? Based on analyses of satellite imagery, the Darwin VAAC reported that on 2 August ash plumes from Bagana rose to an altitude of 3 km (10,000 ft) a.s.l. and drifted 37 km NW and W.
2012 JULY 05 JULY- 10? Based on analyses of satellite imagery, the Darwin VAAC reported that on 4 July ash plumes from Bagana rose to altitudes of 2.4-3 km (8,000-10,000 ft) a.s.l. and drifted 55 km W.
2012 MAY 16 JUNE- 05? According to NASA's Earth Observatory, a satellite image of Bagana acquired on 16 May showed a lava flow on the E flank. Other satellite images indicated that the lava flow was emplaced sometime between March 2011 and February 2012. A plume drifted W.
Based on analyses of satellite imagery, the Darwin VAAC reported that on 7 March an ash plume from Bagana rose to an altitude of 2.4 km (8,000 ft) a.s.l. and drifted 37 km SW.
2011 OCT- 08 Oct- 18? Based on analyses of satellite imagery, the Darwin VAAC reported that during 8-9 October ash plumes from Bagana rose to an altitude of 3 km (10,000 ft) a.s.l. and drifted 45-55 km E and NW. Based on analyses of satellite imagery, the Darwin VAAC reported that on 21 May an ash plume from Bagana rose to an altitude of 2.1 km (7,000 ft) a.s.l. and drifted 65 km NW. 2011 MAY- 16 MAY- 24? RABAUL- Geologic summary by global volcanism program( Smithsonian Inst- USGS): The low-lying Rabaul caldera on the tip of the Gazelle Peninsula at the NE end of New Britain forms a broad sheltered harbor. The outer flanks of the 688-m-high asymmetrical pyroclastic shield volcano are formed by thick pyroclastic-flow deposits. The 8 x 14 km caldera is widely breached on the E, where its floor is flooded by Blanche Bay. Two major Holocene caldera-forming eruptions at Rabaul took place as recently as 3,500 and 1,400 years ago. Three small stratovolcanoes lie outside the northern and NE caldera rims. Post-caldera eruptions built basaltic-to-dacitic pyroclastic cones on the caldera floor near the NE and western caldera walls. Several of these, including Vulcan cone, which was formed during a large eruption in 1878, have produced major explosive activity during historical time. A powerful explosive eruption in 1994 occurred simultaneously from Vulcan and Tavurvur volcanoes and forced the temporary abandonment of Rabaul city. RVO reported that explosions from Rabaul caldera's Tavurvur cone were detected during 1-11 March, notably during 1 and 6-11 March, and generated ash plumes that rose 1 km and drifted E and SE. Mild ash emissions on other days during 1-15 March also drifted E and SE. Gases from Tavurvur caused browning vegetation on Turangunan (South Daughter) since early January. 2014 MAR 01 MAR 26? RVO reported that Rabaul caldera's Tavurvur cone was quiet during 1-15 December. White and occasionally blue vapor plumes rose from the crater, An explosion at 1850 on 15 December generated an ash-poor plume. 2013 NOV- 01 DEC- 03? RVO reported that Rabaul caldera's Tavurvur cone was quiet during 1-12 November. At 0516 on 13 November a moderate explosion generated a dense billowing ash cloud that rose 1 km above the crater and drifted NW. A few more explosions continued after that, at irregular intervals; notably on 14 November at 0738, 0851, 1308, 2044, and on 15 November at 1903. Ash plumes from these events also drifted NW. During 1-15 November seismicity was very low, except for events associated with the explosions. Deformation measurements showed slight inflation of the central part of the caldera; the long-term inflationary trend continued. 2013 AUG- 25 SEP- 10? Based on observations of satellite imagery and wind data analyses, the Darwin VAAC reported that on 25 August ash plumes from Rabaul caldera's Tavurvur cone rose to an altitude of 1.8 km (6,000 ft) a.s.l. and drifted almost 150 km NW. RVO reported that during 16 June-14 July white-to-light-gray plumes sometimes containing fine ash rose at most 2 km from Rabaul caldera's Tavurvur cone and drifted NW and SE. Roaring and rumbling noises also continued, and seismicity was low. Ashfall was reported in areas downwind including Rabaul town (3-5 km NW) during 16-30 June. The lava dome on the crater floor of Tavurvur continued to glow; on 26 June and 4 July observers near the dome noted brief incandescence at the vent associated with strong and rapid venting. Explosions during 10-14 July generated dense gray ash clouds that drifted NW, causing ashfall between Namanula Hill (3 km W) and Malaguna No.1 (NW), and Pilapila and Tavui Point. 2013 JUNE- 18 JUN- 19? RVO reported that during 1-15 June white vapor plumes sometimes containing fine ash rose at most 800 m from Rabaul caldera's Tavurvur cone and drifted NW and SE. Ashfall was reported in areas downwind including Rabaul town (3-5 km NW). Roaring and rumbling noises also continued, and seismicity was low. Photographers observed a 1-m-high lava dome on the crater floor on 12 June. RVO reported that during 29 April-16 May white vapor plumes sometimes containing fine ash rose at most 200 m from Rabaul caldera's Tavurvur cone and drifted NW. Ashfall was reported in areas downwind including Rabaul town (3-5 km NW). Roaring and rumbling noises also continued. Seismicity was low. RVO reported that roaring and rumbling noises from Rabaul were heard during 1-14 April, especially at night. White vapor plumes with ash rose at most 100 m above the main crater and drifted NW, causing ashfall in Rabaul town (3-5 km NW). RVO reported that ash emissions increased at Rabaul on 3 March and were mainly brownish. Emissions again increased the next day, occurring almost every minute. Billowing brown ash clouds slowly rose from the crater then quickly dispersed to the SE. The emissions decreased to about every hour on 7 March. Seismicity was very high during 4-6 March and then declined in the evening of 7 March. Three regional earthquakes felt during this period ranged in magnitude from 5.1-5.5, and occurred SSE from Rabaul offshore outside the Wide Bay area at depths ranging between 50 and 60 km. They were felt in Rabaul town with intensities of III-IV. Emissions were absent during 8-11 March. Activity resumed on 12 March at 1108. An explosion ejected tephra and a gray-to-black billowing ash plume rose 300 m and drifted SE. The forcefulness and color lessened over at least the next 40 minutes; ash plumes rose 100 m, but were carried to 1 km with the wind. Seismicity remained low. 2013 JAN- 19 Feb- 12? RVO reported that roaring and rumbling noises from Rabaul caldera's Tavurvur cone began at 2128 on 19 January and lasted for about 15 minutes. Darkness prevented visual observations but the next day ash emissions were evident. On 20 January small discrete explosions generated ash clouds that rose up to 500 m above the crater and drifted E and SE. A few days before the eruption an observer noticed that vegetation on the N flanks of South Daughter (Turangunan, ~2 km to the E) had browned, and on 18 January a climber reported a strong sulfur dioxide odor. A loud explosion at 2325 on 20 January was followed by a few minutes of continuous roaring and rumbling. During 20-22 January light gray ash emissions occurred at irregular intervals; the color of the plumes suggested mostly water vapor with low ash content. Plumes rose 200 m and drifted ESE on 20 January, and SW, S, and SSE on 21 January. Activity increased during 21-22 January with more frequent ash emissions occurring for extended periods. According to a news article, flights to Tokua airport were cancelled on 21 January. Emissions subsided in the afternoon of 22 January but small-to-moderate explosions continued. A large explosion at 2147 ejected incandescent fragments, and produced an ash plume that rose 2 km and drifted SE and ESE. Explosions were heard through the night. Ash plumes that rose from the crater on 23 January drifted SE. 2012 MAY 01 JUNE- 05? RVO reported that observations of Rabaul caldera's Tavurvur cone during 1-31 May revealed some periods of white emissions. Seismic activity was very low; however, several high-frequency volcano-tectonic earthquakes were recorded. 2011 JULY- 29 Aug- 23? RVO reported that white vapor plumes rose from Rabaul caldera's Tavurvur cone during 15-19 August. No volcano-related seismicity was recorded. The rate of uplift from GPS measurements on Matupit Island had increased from the end of July. 2011 MAY- 19 MAY 21? 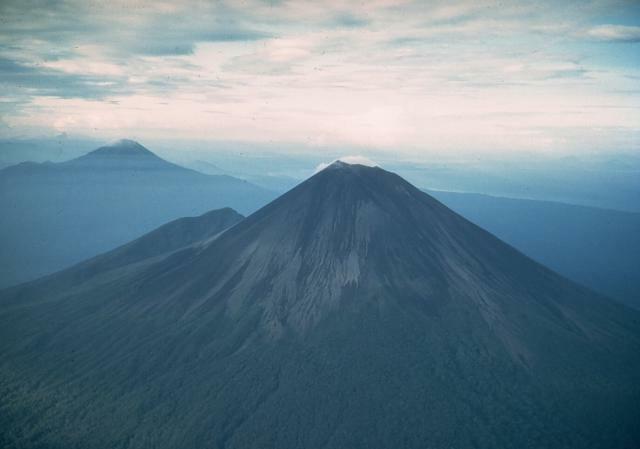 RVO reported that variable amounts of white vapor plumes rose from Rabaul caldera's Tavurvur cone during 1-31 May and were occasionally tinted brown. During 19-21 May thick white plumes rose 2-3 km above the crater. ULAWUN- Geological summary by global volcanism program ( Smithsonian inst./ USGS): The symmetrical basaltic to andesitic Ulawun stratovolcano is the highest volcano of the Bismarck arc, and one of Papua New Guinea's most frequently active. Ulawun rises above the N coast of New Britain opposite Bamus volcano. The upper 1,000 m of the 2,334-m-high volcano is unvegetated. A steep-walled valley cuts the NW side of the volcano, and a flank lava-flow complex lies to the S of this valley. Historical eruptions date back to the beginning of the 18th century. Twentieth-century eruptions were mildly explosive until 1967, but after 1970 several larger eruptions produced lava flows and basaltic pyroclastic flows, greatly modifying the summit crater. RVO reported that activity at Ulawun was low during 1-15 December; pale gray ash plumes rose from the crater. People between Sena Estate and Noau on the N flank reported ashfall in early December. RVO reported that during 1 October-15 November activity at Ulawun was low; small volumes of white vapor and gray and gray-brown ash plumes rose 100 m above the crater and drifted S. Seismicity was low with RSAM values fluctuating between 100 and 150 units throughout the period. 2013 SEP- 10 SEP- 10? RVO reported that activity at Ulawun was low during 4-31 August; emissions from the summit crater consisted of white vapor until 16 August, and were gray during 17-31 August. Emissions were more energetic on 24 August, rising 200 m. A single booming noise and weak incandescence was also reported that day. RSAM values fluctuated but decreased overall. RVO reported that activity at Ulawun was low during 22 July-4 August; emissions from the summit crater consisted of white vapor. Seismicity was also low. RSAM values decreased from 80 on 21 July to 50 on 31 July, and then began to increase on early 2 August. By 4 August RSAM values reached 600, attributed to an increase in volcanic tremor. 2012 NOV- 06 DEC- 19? RVO reported that starting on 6 November through 30 November Ulawun produced pale grey and brown ash plumes that rose 200 m and drifted in multiple directions. Ashfall was reported on the N and NW flanks, in Voluvolu, Noau, Ubili (10 km NW), and Ulamona (10 km NW). Low rumbling was heard on 18 November. RVO reported that during 1-9 May diffuse white plumes rose from Ulawun and Real-time Seismic-Amplitude Measurement (RSAM) values ranged between 70 and 100. During 9-10 May RSAM values distinctly increased, fluctuated, and peaked at 1300 units before declining back to 100 units. During this time local residents heard booming. On 10 May grey-to-brown ash plumes were observed. THis volcanoe is in the near or part of a former supervolcano! ABOUT TONGARIRO( geological summary by Smithsonian instuitute/ global volcanism program): Tongariro is a large andesitic volcanic massif, located immediately NE of Ruapehu volcano, that is composed of more than a dozen composite cones constructed over a period of 275,000 years. Vents along a NE-trending zone extending from Saddle Cone (below Ruapehu volcano) to Te Mari crater (including vents at the present-day location of Ngauruhoe) were active during a several hundred year long period around 10,000 years ago, producing the largest known eruptions at the Tongariro complex during the Holocene. The youngest cone of the complex, Ngauruhoe, has grown to become the highest peak of the massif since its birth about 2500 years ago. The symmetrical, steep-sided Ngauruhoe, along with its neighbor Ruapehu to the south, have been New Zealand's most active volcanoes during historical time. On 25 March GeoNet reported that Tongariro remained quiet with no eruptive activity being detected since the explosion on 21 November 2012. Steam-and-gas plumes rose from the Te Maari Craters. The Aviation Colour Code was lowered to Green (second lowest on a 4 four-color scale) and the Volcanic Alert Level remained at 1 (on a scale of 0-5). 2013 APR- 02-update APR- 02? 2013 FEBRUARY- 14 FEB- 19? On 14 February GeoNet reported that Tongariro remained quiet with no eruptive activity being detected since the explosion on 21 November 2012. Steam-and-gas plumes rose from the Te Maari Craters, and were unusually strong during the recent weeks possibly due to weather conditions. The Aviation Colour Code remained at Yellow (second lowest on a 4 four-color scale) and the Volcanic Alert Level remained at 1 (on a scale of 0-5). 2012 NOVEMBER- 05 NOV- 27? On 5 November, GeoNet reported that several teams of scientists had been visiting Tongariro's Te Mari Craters to service portable seismometers (complementing four permanent installations), sample gas vents, and collect samples of ejecta. The report noted that not many earthquakes had been recorded recently, and that the hottest gas vent was 235 degrees Celsius while the others ranged from 95-104 degrees. On 30 October the sulfur dioxide flux was 154 tonnes per day and the carbon dioxide flux was 477 tonnes per day. The volcano continued to actively degas. The Aviation Colour Code remained at Yellow and the Volcanic Alert Level remained at 1 (signs of volcano unrest). 2012 OCTOBER- 12 OCT- 17? On 12 October, the GeoNet Data Centre reported that Tongariro had been degassing after the 6 August eruption from the Te Mari Craters. Gas plumes drifted downwind and were detected a hundred kilometers or more away. During the previous two weeks an odor was noticed in Manawatu (112 km S) and Hawke's Bay (120 km ESE). 2012 SEPTEMBER- 30 Oct- 02? The GeoNet Data Centre reported that researchers visited Tongariro's Upper Te Mari Craters on 30 September to sample several of the fumaroles, conduct a carbon dioxide soil gas survey, collect ejecta from the 6-7 August eruption, and photograph the area. They found that the average carbon dioxide soil gas flux was lower than the 27 July measurements; 24 sites had increased fluxes while 20 had decreased. The estimated soil gas emission has decreased from about 5.8 to 2.5 tonnes per day based on these measurements. GeoNet reported that favorable weather allowed GNS Science and Department of Conservation scientists to conduct an observation flight over Tongariro on 8 August. They noted actively steaming vents that were visible at a new crater area formed on 6 August below the Upper Te Mari crater, but low clouds prevented any views above this elevation. Blocks of old and hydrothermally altered lava, as large as 1 m in diameter, ejected by the eruption fell 1.5-2 km from the Te Mari craters area. Falling blocks formed impact craters in the ground in an extensive area to the E and W of the new vents. Most blocks were covered by grey ash but many on the W slopes were not, suggesting that they were ejected after the main ash-producing phase of the eruption. The scientists also noted that previously steaming ground at Ketetahi and Lower Te Mari crater appeared more vigorous, but there were no obvious major changes. A debris flow generated by the eruption partly filled a stream valley draining N-W from the Upper Te Mari crater area. The deposit had blocked some stream tributaries but most water diverted around the edges. Ash had slumped from the banks into the stream valley, and in other stream valleys ash has been re-mobilized in slurry flows. No lahars were generated by the eruption. New rock falls were visible around the walls of the new vent area and Lower Te Mari craters and in some stream valley walls near the craters. This suggested that significant ground shaking took place during the eruption. The Alert Level remained at 2 (on a scale of 0-5) and the Aviation Colour Code was lowered to Yellow (second lowest on a four-color scale). During 8-9 August seismic activity remained at a low level; only a few small events were recorded. Preliminary analysis of the ash showed that there was little to no new magma erupted. Gas analysis on 9 August revealed emissions around 2,100 tonnes per day of sulfur dioxide, 3,900 tonnes per day of carbon dioxide, and 364 tonnes per day of hydrogen sulfide, confirming the presence of magma below the volcano. During an overflight on 9 August scientists observed minor ash emissions from the vents. Seismicity continued to remain low during 10-14 August. Heavy rains on 12 August caused a lahar to cross State Highway 46, approximately 6 km W of Rangipo. 2012 AUGUST 07 AUG- 21? On 6 August GeoNet reported that volcanic earthquakes continued beneath Tongariro but the size and number had decreased; there were fewer than five events each day. At about 2350 a short-lived (~1-2 minutes) phreatic eruption occurred at the Te Mari craters area, followed by a series of discrete small earthquakes over the next few tens of minutes. The Alert Level was raised to 2 (on a scale of 0-5) and the Aviation Colour Code was raised to Orange (second highest on a four-color scale). An ash plume drifted E and ashfall was reported in areas around the volcano. According to a news article, a GNS Science volcanologist noted that there were reports of "red hot rocks being thrown out of the crater", explosions, and lighting. The article also stated that some people in the Tongariro area had self-evacuated following the eruption. The Desert Road section of State Highway 1 (NE) had been closed due to poor visibility from the ash, and about 5 cm of ash had fallen on State Highway 46, to the N. Some flights to and from Gisborne (210 km ENE), Rotorua (120 NNE), Taupo (60 km NE), and Palmerston North (135 km S) were delayed or cancelled due to the eruption, and Hawke's Bay Airport (110 km ESE) had closed. GeoNet observed that no volcanic tremor occurred in the days preceding the eruption. The last eruption occurred in 1897. On 7 August white steam clouds rose from the Te Mari craters area but poor weather conditions at the time obscured a direct view of the active vent(s). A few small earthquakes had been detected. A news article stated that alpine guides observed three active vents that appeared to be new. A sequence of small volcanic earthquakes beneath Tongariro was detected by a few of the seismometers in the permanent network. Earthquakes with magnitudes less than 2.5 were clustered between Emerald Crater (E of the summit) and the Te Mari craters (2 km E east of Ketetahi hot springs on the N flank) at 2-7 km depth. The sequence started on 13 July, soon declined, and then again increased during 18-20 July. The Alert Level was raised to 1 (on a scale of 0-5) and the Aviation Colour Code was raised to Yellow (on a four-color scale) on 20 July. In response to the increased seismicity, GeoNet installed four portable seismographs and conducted gas and spring sampling. During 21-22 July seismicity declined; one event was detected on 23 July. Provisional analysis of the gas samples collected during 21-22 July indicated a marked increase in the volcanic gas component of the typical mix of volcanic and hydrothermal gases. Residents reported a gas odor. LANGILA- Geological summary by global volcanism program ( Smithsonian inst./ USGS):Langila, one of the most active volcanoes of New Britain, consists of a group of four small overlapping composite cones on the lower eastern flank of the extinct Talawe volcano. Talawe is the highest volcano in the Cape Gloucester area of NW New Britain. A rectangular, 2.5-km-long crater is breached widely to the SE; Langila volcano was constructed NE of the breached crater of Talawe. An extensive lava field reaches the coast on the N and NE sides of Langila. Frequent mild-to-moderate explosive eruptions, sometimes accompanied by lava flows, have been recorded since the 19th century from three active craters at the summit of Langila. The youngest and smallest crater (no. 3 crater) was formed in 1960 and has a diameter of 150 m.
Based on analyses of satellite imagery, the Darwin VAAC reported that an ash plume from Langila rose to an altitude of 2.1 km (7,000 ft) a.s.l. and drifted 110 km NW on 5 December. Elevated sulfur dioxide concentrations were also detected. 2012 DEC- 06 DEC- 11? According to the Darwin VAAC, an ash plume at an altitude of 1.5 km (5,000 ft) a.s.l. was observed by a pilot on 1 December. Ash was not detected in satellite imagery. About RUAHWPU( geological summary by global volcanis program ( Smithsonian inst/ USGS): Ruapehu, one of New Zealand's most active volcanoes, is a complex stratovolcano constructed during at least four cone-building episodes. The 110 cu km volcanic massif is elongated in a NNE-SSW direction and is surrounded by another 100 cu km ring plain of volcaniclastic debris. A single historically active vent, Crater Lake, is located in the broad summit region, but at least five other vents on the summit and flanks have been active during the Holocene. Frequent mild-to-moderate explosive eruptions have occurred in historical time from the Crater Lake vent. Lahars produced by phreatic eruptions from the summit crater lake are a hazard to a ski area on the upper flanks and to river valleys below the volcano. On 12 March, GeoNet reported that the Volcanic Alert Level for Ruapehu remained at 1 (signs of volcano unrest) and the Aviation Colour Code was lowered to Green based on the analysis of monitoring data and the lack of recent seismic activity. 2013 MAR- 05 MAR- 12?? On 5 March, GeoNet reported that monitoring of the Ruapehu Crater Lake showed that temperatures at depth remained above background levels but had started a declining trend. Gas data from January and February showed emission rates of 15-25 tonnes per day of sulfur dioxide and around 650 tonnes per day carbon dioxide; these are within the usual range of emissions measured at Ruapehu. Seismicity remained low, characterized by weak volcanic tremor and some shallow earthquakes. Areas of discoloration in the lake, sometimes observed during the previous few weeks, are relatively common and thought to reflect internal lake convection processes. Scientists speculated that there was a partial blockage between the deep and shallow systems causing the lake temperature to remain steady; the relatively low temperature of Crater Lake, 22-25°C since March 2012, is one of the longest periods of low lake temperatures recorded. The Volcanic Alert Level remained at 1 (signs of volcano unrest) and the Aviation Colour Code remained at Yellow. 2012 NOV 13?+ DEC- 05? On 3 December, GeoNet reported that monitoring data suggested that Ruapehu continued in a state of unrest. Scientists aboard an overflight observed that the crater lake was quiet and that the temperature remained steady at 22 degrees Celsius. Seismicity had decreased since the early part of November. The Volcanic Alert Level remained at 1 (signs of volcano unrest) and the Aviation Colour Code remained at Yellow. On 5 November, GeoNet reported that Ruapehu's summit Crater Lake was hot during field visits in December 2011 and January 2012, exhibiting temperatures over 35 degrees Celsius. The lake cooled afterwards, reaching 16 degrees in May and fluctuating between 18-24 degrees during June-October. Scientists visited the lake in late October and reported that the water temperature was 19.5 degrees. During that visit they observed weak convection near the center of the blue-green lake. GeoNet noted that Ruapehu is often seismically active; during the last month weak volcanic tremor was recorded and more recently several small earthquakes under the volcano had been detected. The largest earthquake was an M 2. An overflight on 26 October to measure gas flux revealed that sulfur dioxide was 63 tonnes per day and carbon dioxide was 908 tonnes per day. The Aviation Colour Code remained at Green and the Volcanic Alert Level remained at 1 (signs of volcano unrest). On 5 April, GeoNet reported that the temperature of Ruapehu's summit Crater Lake had been high for a sustained period and was currently between 38 and 39 degrees Celsius. The highest temperature since unrest began in October 2010 was 41 degrees Celsius, measured on 1 March. The report also noted that during the previous few weeks there was an increase in carbon dioxide gas emissions, increased seismicity, and changes in Crater Lake water chemistry. The unrest prompted GeoNet to raise the Aviation Colour Code although the Volcanic Alert Level remained at 1 (some signs of volcano unrest). Based on analyses of satellite imagery and wind data, the Darwin VAAC reported that during 26-27 March ash plumes from Karkar rose to an altitude of 2.4 km (8,000 ft) a.s.l. and drifted almost 50 km ENE and NW. 2014 MAR 26 APR 01? 2013 MARCH- 19 MAR- 19? Based on analyses of satellite imagery and wind data, the Darwin VAAC reported that on 26 February an ash plume from Karkar rose to an altitude of 8.5 km (28,000 ft) a.s.l. and drifted 75 km N and 130 km E.
Based on analyses of satellite imagery and wind data, the Darwin VAAC reported that on 26 February an ash plume from Karkar rose to an altitude of 9.1 km (30,000 ft) a.s.l. 2013 JANUARY (day?) JAN- 30? Based on analyses of satellite imagery and wind data analyses, the Darwin VAAC reported that an ash plume from Karkar rose to an altitude of 4.3 km (14,000 ft) a.s.l. and drifted less than 40 km NE. 2012 FEBRUARY 01- FEB- 07? Based on analyses of satellite imagery, the Darwin VAAC reported that a possible ash plume from Karkar rose to altitudes of 7.6-10.7 km (25,000-35,000 ft) a.s.l. and drifted NE and E on 1 February. May- 19- 2011 EARTHQUAKE ACTIVITIES have also increased over the last week, mainly in the TONGA/ FIJI region but are still under the average leveks of the last years. highest magnitude was 5.7 ( Tonga) and 5.5 ( Eastern N Guinea) INCREASING: activity at ULAWUN is ongoing, The alert level at the more ore less permanently, but strombilian active volcano Yasur has been raised to 2, after the volcano became eruptive with explosions on May 12. About GAUA( geological summary by global volcanis program ( Smithsonian inst/ USGS):The roughly 20-km-diameter Gaua Island, also known as Santa Maria, consists of a basaltic-to-andesitic stratovolcano with an 6 x 9 km wide summit caldera. Small parasitic vents near the caldera rim fed Pleistocene lava flows that reached the coast on several sides of the island; several littoral cones were formed where these lava flows reached the sea. Quiet collapse that formed the roughly 700-m-deep caldera was followed by extensive ash eruptions. Construction of the historically active cone of Mount Garat (Gharat) and other small cinder cones in the SW part of the caldera has left a crescent-shaped caldera lake. The symmetrical, flat-topped Mount Garat cone is topped by three pit craters. The onset of eruptive activity from a vent high on the SE flank of Mount Garat in 1962 ended a long period of dormancy. On 14 August the Vanuatu Geohazards Observatory reported that activity at Gaua had increased since June; volcanic tremor levels increased slightly and ash plume emissions continued. The Alert Level remained at 1 (on a scale of 0-4). 2013 AUG- 14- 2013 AUG- 20? 2011 OCT- 10 OCT- 18? Vanuatu Geohazards Observatory reported that the seismic network monitoring Gaua detected volcanic activity in August. Gas plumes were detected by the OMI satellite on 17, 27, and 28 September, and ashfall was reported in the N, E, and W parts of Gaua on 10 October by local authorities. The Alert Level remained at 1 (on a scale of 0-4). ABOUT TINAKULA ( geological summary by Smithsonian instuitute/ global volcanism program):The small 3.5-km-wide island of Tinakula is the exposed summit of a massive stratovolcano that rises 3-4 km from the sea floor at the NW end of the Santa Cruz islands. Tinakula resembles Stromboli volcano in containing a breached summit crater that extends from the 851-m-high summit to below sea level. Landslides enlarged this scarp in 1965, creating an embayment on the NW coast. The satellitic cone of Mendana is located on the SE side. The dominantly andesitic Tinakula volcano has frequently been observed in eruption since the era of Spanish exploration began in 1595. In about 1840, an explosive eruption apparently produced pyroclastic flows that swept all sides of the island, killing its inhabitants. Frequent historical eruptions have originated from a cone constructed within the large breached crater. These have left the upper flanks of the volcano and the steep apron of lava flows and volcaniclastic debris within the breach unvegetated. According to NASA's Earth Observatory, thermal anomalies from Tinakula were detected in satellite data during 13-14 February and a gas plume with possible ash content rose from the volcano on 14 February. 2012 FEB 13 FEB- 22? According to Institute of Geological & Nuclear Sciences Limited (GNS) in a media release on 11 August, the Laboratoire de Géophysique (Papeete, Tahiti) reported that seismographs in Rarotonga recorded eruptive activity at Monowai seamount on 3 August. The activity then stopped overnight. 2012 AUGUST- 09 AUG- 14? A navy ship heading to the Kermadec Islands has sailed into a huge 25,000 square kilometre area of pumice pieces north of Auckland. It is believed to be from New Zealand's third erupting volcano – the undersea mount Monowai. In the past week both Mt Tongariro and White Island have erupted. The navy said the raft – 463 kilometres by 55 kilometres – was spotted by an RNZAF Orion returning on patrol from Samoa. Lieutenant Tim Oscar, a Royal Australian Navy officer on an exchange with the NZ Navy, saw what he described as "the wierdest thing I've seen in 18 years at sea." A huge mass of small volcanic rocks (pumice) was spotted in the South Pacific ocean (north of Auckland, New Zealand) on August 9, 2012 by a New Zealand air force plane. Royal Australian Navy officer, Lieutenant Tim Oscar onboard navy ship heading to the Kermadec Islands, described it as “the weirdest thing I’ve seen in 18 years at sea.” “The lookout reported a shadow on the ocean ahead of us so I ordered the ship’s spotlight to be trained on the area. As far ahead as I could observe was a raft of pumice moving up and down with the swell. The rock looked to be sitting two feet above the surface of the waves, and lit up a brilliant white colour in the spotlight. It looked exactly like the edge of an ice shelf. I knew the pumice was lightweight and posed no danger to the ship. None the less it was quite daunting to be moving toward it at 14 knots. It took about 3 – 4 minutes to travel through the raft of pumice and as predicted there was no damage. As we moved through the raft of pumice we used the spotlights to try and find the edge – but it extended as far as we could see,” said Lieutenant Oscar. Pumice is made from lava and water and is very lightweight, so it poses no danger to ships. 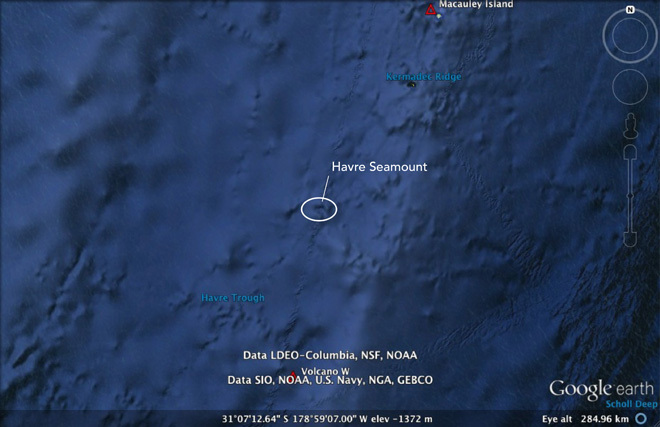 About HAVRE SEAMOUT- by smithsonian global volcanism prgram:( new Seamount- not registered yet) Editor's Note: Havre Seamount is not currently in the Global Volcanism Program's database. The latitude and longitude in the header information come from the GNS report and may be updated at a later date, along with the summit elevation and Geologic Summary. 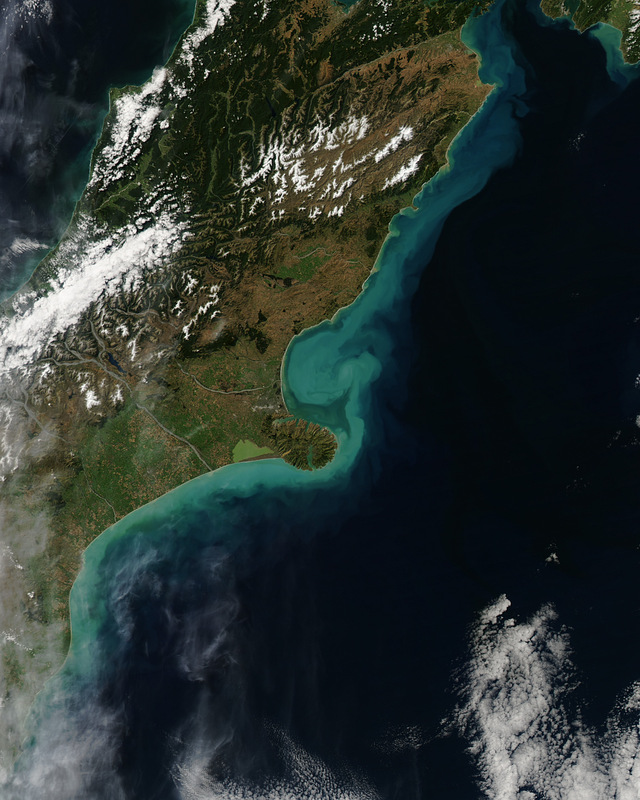 The GeoNet Data Centre reported that on 1 October a pilot observed floating pumice in the Kermadec Islands NE of New Zealand. The area of pumice started about 300 km W of Raoul Island and extended in a NE direction for about 600 km. The report speculated that the pumice was from the 18-19 July eruption of Havre Seamount and noted that there was no evidence that the volcano had erupted again. 2012 OCT- 01 OCT- 02? 2012 AUG- 24 Aug- 21? According to NASA's Earth Observatory, a satellite image acquired on 24 August showed linear clusters of pumice, from the mid-July eruption from Havre Seamount, floating in the ocean around L'Esperance Rock (about 50 km SE). Editor's Note: Havre Seamount is not currently in the Global Volcanism Program's database. The latitude and longitude in the header information come from the GNS report and may be updated at a later date, along with the summit elevation and Geologic Summary. This volcano is in the near or part of a former supervolcano! ABOUT KAVACHI (geological summary by Smithsonian instuitute/ global volcanism program):Kavachi, one of the most active submarine volcanoes in the SW Pacific, occupies an isolated position in the Solomon Islands far from major aircraft and shipping lanes. Kavachi, sometimes referred to as Rejo te Kvachi ("Kavachi's Oven"), is located south of Vangunu Island only about 30 km north of the site of subduction of the Indo-Australian plate beneath the Pacific plate. The shallow submarine basaltic-to-andesitic volcano has produced ephemeral islands up to 1 km long many times since its first recorded eruption during 1939. Residents of the nearby islands of Vanguna and Nggatokae (Gatokae) reported "fire on the water" prior to 1939, a possible reference to earlier submarine eruptions. The roughly conical volcano rises from water depths of 1.1-1.2 km on the north and greater depths to the south. Frequent shallow submarine and occasional subaerial eruptions produce phreatomagmatic explosions that eject steam, ash, and incandescent bombs above the sea surface. On a number of occasions lava flows were observed on the surface of ephemeral islands. According to NASA's Earth Observatory, a satellite image acquired on 29 January showed a plume of discolored water E of Kavachi, likely from lava fragments and dissolved gases. A bright area above the submerged peak suggested churning water. There was no sign that the volcano had breached the sea surface. 2014 Jan 29 FEB 04? ABOUT WHITE ISLAND (geological summary by Smithsonian instuitute/ global volcanism program):Uninhabited 2 x 2.4 km White Island, one of New Zealand's most active volcanoes, is the emergent summit of a 16 x 18 km submarine volcano in the Bay of Plenty about 50 km offshore of North Island. The 321-m-high island consists of two overlapping andesitic-to-dacitic stratovolcanoes; the summit crater appears to be breached to the SE because the shoreline corresponds to the level of several notches in the SE crater wall. Volckner Rocks, four sea stacks that are remnants of a lava dome, lie 5 km NNE of White Island. Intermittent moderate phreatomagmatic and strombolian eruptions have occurred at White Island throughout the short historical period beginning in 1826, but its activity also forms a prominent part of Maori legends. Formation of many new vents during the 19th and 20th centuries has produced rapid changes in crater floor topography. Collapse of the crater wall in 1914 produced a debris avalanche that buried buildings and workers at a sulfur-mining project. On 22 January, the GeoNet Data Centre reported that the Volcanic Alert Level for White Island remained at 1 and the Aviation Colour Code remained Green. Since a moderate eruption on 11 October 2013, seismicity had remained at low levels while gas flux was elevated. Sulfur dioxide flux ranged from 133 to 924 tonnes per day, higher than levels before 2012 when daily averages were less than 300 tonnes. The level of the water in Crater Lake continued to rise, and was about 5 m deeper than in late 2013. Temperature measurements with a recently acquired thermal Infrared camera confirm that hot gases were rising from vents on the lava dome; temperatures at the vents were 200-330 degrees Celsius, and over 400 degrees at one vent. 2014 Jan 22 Jan- 28? 2013 NOV- 05 NOV- 06? On 4 November, the GeoNet Data Centre reported that the Volcanic Alert Level remained at 1 while the Aviation Colour Code was decreased from Yellow to Green. Since 11 October, seismicity and gas flux have remained at low levels, however, the volcano-hydrothermal system was considered unstable. GeoNet stated that eruptive activity could occur without prior warning and that current conditions permitted a range of eruptive activity. On 21 October the GeoNet Data Centre reported that no further eruptive activity at White Island was detected after the eruption on 11 October, which ejected material over 350 m from the active vent and caused a wet surge cloud that enveloped the Main Crater. Volcanic tremor levels had decreased after the eruption and continued at variable levels. Gas flight measurements on 17 October showed that the SO2 flux was 450 tonnes per day, CO2 was 1,140 tonnes per day, and H2S was12 tonnes per day. The SO2 and H2S flux had changed very little, and CO2 had decreased from the previous measurements on 23 August. The Volcanic Alert Level was lowered to 1 and the Aviation Colour Code remained at Yellow. 2013 AUG- 21 AUG- 26? The GeoNet Data Centre reported that after the eruption at White Island on 20 August, activity remained low through the next day. Steam-and-gas plumes continued to be emitted. During the afternoon on 21 August the Volcanic Alert Level was lowered to 1 and the Aviation Colour Code was lowered to Yellow. The GeoNet Data Centre reported that a small eruption from White Island occurred at 1023 on 20 August and continued for about 10 minutes. The eruption ejected mud and rocks short distances, and generated a voluminous steam plume (visible from the Bay of Plenty coast), that rose 4 km a.s.l. and then slowly dispersed. Weather radar observations showed that a minor amount of ash was present in the plume. The Volcano Alert Level was raised to 2 (on a scale of 0-5) and the Aviation Colour Code was raised to Red (on a four-color scale). Later that day the Aviation Colour Code was lowered to Orange. The eruption originated in the active crater area that had been ejecting small amounts of mud in recent weeks. A short period of strong volcanic tremor was detected the previous morning, but it was not clear if it was related to the eruption. 2013 JULY- 26 AUG- 06? GeoNet Data Centre reported that volcanic tremor levels at White Island increased overnight during 25-26 July; the increased seismicity and images of activity on web cameras prompted volcanologists to visit the volcano on 26 July. They noted audible jets of gas venting through the small lake, broader expanding “bubbles” of dark lake sediments, and debris ejected 20-30 m vertically. The Volcano Alert Level remained at 1 (on a scale of 0-5) and the Aviation Colour Code was increased to Yellow (on a four-color scale). 2013 JULY- 09 JULY- 09? On 9 July GeoNet Data Centre reported that over the previous few weeks very small volcanic earthquakes occurred at White Island approximately every 70 seconds; the hundreds of small bursts created a unique daily pattern on the seismograph. The pattern of the volcanic earthquakes changed over time; the tremor bursts changed in size and frequency and sometimes merged into continuous tremor. Neither increased gas emissions nor changes in the hot lake and recently-erupted lava dome suggested that the process creating the earthquakes, possibly fluid moving through a crack, was occurring at depth. The Volcano Alert Level remained at 1 (on a scale of 0-5) and the Aviation Colour Code remained at Green (on a four-color scale). 2013 APR 29 APR- 30? On 29 April GeoNet Data Centre reported that activity at White Island remained at a persistently low level, characterized by tremor and degassing. No mud or ash eruptions had been observed since early April. A volcanologist visited the island the previous week and observed that increased rainfall had caused the two lakes to merge together into one larger lake. The temperature of the lake was 62 degrees Celsius and the lava-dome temperature was 200 degrees. The lower level of activity prompted GeoNet to reduce the Aviation Colour Code to Green (indicating no active eruption). The Volcano Alert Level remained at 1 (on a scale of 0-5). 2013 MAR- 26 APR 02? On 26 March GeoNet Data Centre reported that a pattern of repeating minor activity at White Island had become established over the last month. Periods of passive steaming and degassing were accompanied by very low levels of volcanic tremor. This activity alternated with minor mud-and-steam explosions from the active crater when there was strong volcanic tremor. Sulfur dioxide gas measurements on 20 March were at similar levels to the past month, although carbon dioxide levels were higher. The Aviation Colour Code remained at Yellow and the Volcanic Alert Level remained at 1 (on a scale of 0-5). 2013 FEB- 23 MAR- 05? GeoNet Data Centre reported that ash venting from White island occurred at about 1130 and 1330 on 23 February. The Aviation Colour Code was raised to Orange and the Volcanic Alert Level was raised to 2 (on a scale of 0-5). During a field investigation on 25 February scientists observed that ash emissions had ceased and small scale steam-and-gas explosions were occurring at the active vent. Volcanic tremor had also increased. On 22 January GeoNet Data Centre reported that unrest at White Island continued. A volcanologist visiting the area on 21 January observed that hydrothermal activity in the small "hot lake" had increased. The lake surface "domed up" from rising steam and gas, that also brought large amounts of sediment to the surface, often with a vivid white steam-and-gas "flashing" from around the base. Stronger events periodically occurred. The report noted that the activity had been increasing since late 2012 and was now semi-continuous. The Aviation Colour Code remained at Yellow (second lowest on a four-color scale) and the Volcanic Alert Level remained at 1. On 7 January GeoNet Data Centre reported that the Aviation Colour Code for White Island was lowered to Yellow (second lowest on a four-color scale) and the Volcanic Alert Level was lowered to 1. A spiny lava dome in the crater formed on 5 August was first clearly observed on 10 December. Observations on 20 December indicated that the dome had not changed. Scientists visited the area on 1 January and again observed no changes. They measured temperatures of 200-240 degrees Celsius from the lava dome and 70-80 degrees from the nearby hot lake, and observed lots of gas coming from the lake. The report also indicated continuing elevated levels of tremor. 2012 DEC- 20 DEC- 26? On 20 December, GeoNet Data Centre reported that the spiny lava dome at White Island had not changed during the previous 10 days. No changes to the lava dome were noted when scientists compared photos taken on 19 December to previous ones, but several small lakes occupied parts of where a large lake was before August. The highest temperature reading from the lava dome was 187 degrees Celsius, the hot lake to the S was at least 71 degrees and upwelling strongly, and the cool lake on the N side of the dome was 35 degrees. The Alert Level remained at 2 (on a scale of 0-5), and the Aviation Colour Code remained at Orange (second highest on a four-color scale). 2012 DEC- 12 DEC- 12? On 12 December the GeoNet Data Centre posted a report describing a new lava dome at White Island that volcanologists recently noticed. The spiny lava dome was 20-30 m in diameter and grew in a crater formed during an eruption on 5 August. A prominent steam plume rose from the dome. Comments from tour operators at White Island suggested that the dome may have been visible two weeks earlier, but not as clearly as on 10 December. The Alert Level was raised to 2 (on a scale of 0-5), and the Aviation Colour Code was raised to Orange (second highest on a four-color scale). 2012 JULY- 27 AUG- 21? The GeoNet Data Centre reported that during 2011 and early 2012 White Island Crater Lake slowly evaporated, exposed steam vents, and formed two large muddy pools. Sometime between 27 July and 28 July, the lake level quickly rose 3-5 m. Vigorous gas-and-steam emissions through the new lake were observed from the air. Gas emission measurements on 1 August showed that sulfur dioxide had increased during the previous three months but carbon dioxide levels did not change. Since early July there had been intermittent periods of volcanic tremor, including several hours early on 28 July and during 30-31 July. GeoNet noted that tremor was not uncommon at White Island but earlier in 2012 it had been at very low levels. A recent ground survey showed that the main crater floor was no longer subsiding and may have been slowly rising. The Alert Level remained at Level 1 (on a scale of 0-5), indicating signs of volcano unrest. The Aviation Colour Code increased to Yellow (second lowest on a four-color scale). A particularly strong period of volcanic tremor was recorded during 4-5 August, and ended with an earthquake at 0454. Web camera images from between 0454 and 0457 showed an eruption from Crater Lake. This was the first time ash has been produced from White Island since 2000. The Alert Level was raised to 2 and the Aviation Colour Code was raised to Orange. A steam plume rose from the crater on 5 August. Around 2330 on 7 August volcanic tremor sharply decreased to levels detected prior to the current episode of unrest. A few hours after this drop, the color of the plume changed from white to light brown, indicating more ash in the plume. Visual observations over the past few days showed that a small cone was building in the lake around the main area of degassing.